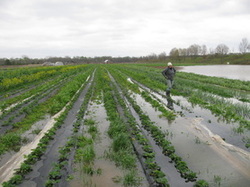 Snow's Bend Farm is located outside Tuscaloosa, Alabama, in the rural community of Coker. The ecological mix of wooded hills, coves, ridges, forested swamp, and bottomland pasture allows native species to flourish and makes for quite a scenic landscape. “Tuscaloosa Choccolocco,” is made up of fine silt and large amounts of organic matter deposited over millennia in flood events. Alabama’s mild climate and the soil’s fertility have made the farm an excellent agricultural site since prehistoric times. As shown by a mound and many artifacts, the land was in use by the Mississippian people more than 700 years ago for hunting, agriculture, and ceremony. 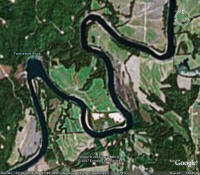 More recently, the farm produced crops of corn, cotton, and soybeans and pasture for livestock. 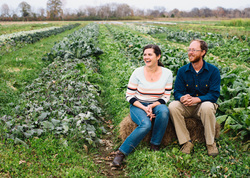 In 2004, after learning and practicing organic agriculture in Alabama, Tennessee, California, Washington, Ecuador, Senegal, and Morocco, Margaret Ann Toohey and David Snow returned home to begin their own farming operation. Through much hard work and intense determination the two’s garden has grown from less than ¼ acre in 2004 to more than 10 acres in 2010, on which 50 different vegetables of nearly 250 varieties and numerous cut flowers are grown. Then 2009 brought the first livestock to the farm. The farmers plan to diversify to include a perennial fruit orchard and an heirloom seed saving garden to preserve genetic diversity and select for local adaptability. Future plans also include biodiversity and wildlife habitat enhancements such as bird and bat houses and mixed species hedgerows to provide a year round nectar supply for native bees and beneficial insects.